The last time Apple released an OS X update for free, it was playing defense. OS X 10.0 was slow and buggy and adoption was slow; version 10.1, rolled out in September 2001, was an apology release for the pioneers on Apple’s then-new Mac operating system. Twelve years later, Apple’s playing offense. OS X Mavericks (technically version 10.9) launches a new era of Mac operating systems, complete with a non-feline nickname and a blank price tag. It’s free as in beer, whether you’re running Snow Leopard or Lion or Mountain Lion, and just as with its many free iOS updates, Apple wants you to upgrade. This review can’t tell you whether or not to spend your hard-earned money on this upgrade, because, well, Mavericks won’t cost you a penny. But I can at least explain the highs and lows of this new update as you make the decision about whether to stay put or accept Apple’s generous offer and catch the Mavericks wave. Recent releases of OS X have sought to minimize the amount of time users have to spend managing files in the Finder. From the Dock to Spotlight to Launchpad, Apple has invested a lot of effort into offering Finder alternatives. And yet Mavericks offers new features that are positively Finder-centric. For all of Apple’s attempts to allow users to bypass the Finder, it’s not going anywhere, so it might as well be improved. Web browsers used to feature separate windows for every webpage. At some point, someone clever decided that window clutter was bad, and that it might be easier to allow several pages to be contained in a stack of tabs inside a single window. A revolution was born, one that has made it all the way to the Finder with Mavericks. Tabs in the Finder work just like they do in Safari. If all you do in the Finder is double-click on things, you’ll never actually see a tab. Double-clicking a folder in the Finder opens it in the same window. If you want to open a folder in a new tab, hold down the Command key while double-clicking. Just as in Safari, you can also type Command-T to open a new tab manually. 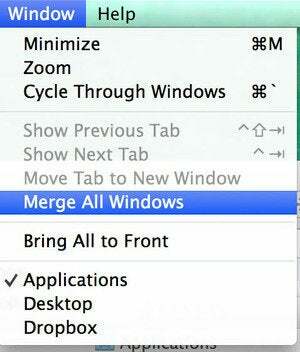 If you end up with a whole lot of Finder windows open, you can gather them all together as a series of tabs in one window by choosing Merge All Windows from the Window menu. Collect all open Finder windows in tabs. Each tab behaves like its own Finder window; you can adjust the view settings of each one accordingly, so one tab can show an icon view, another a list view, and so on. Once you’ve got multiple tabs open, you can move files from one tab to another by dragging and dropping them on a tab. The process behaves just like dropping files on a folder. If you drag and drop, it’ll move the file there. If you drag and hold, the tab will behave like a spring-loaded folder, and that tab will become active. 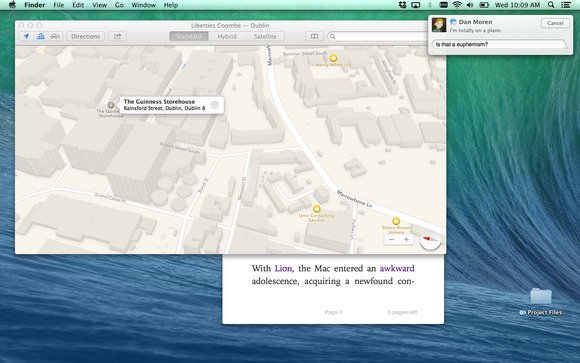 Along with support for tabs, the Finder now offers a full-screen mode. So if you’re Desktop-phobic, you can shift the Finder into a single window full of tabs and use Mission Control to move into and out of it. The addition of tabs in the Finder seems like a feature that’s destined for power users, not the masses. For readers of sites like Macworld, it’s a cool productivity booster. But no regular user is ever going to command-click on a folder and discover tabs, and that’s probably fine. As for me, I’m still getting used to it. Tagged icons come with circles. Though Mavericks brings new features to the Finder, it’s not as if Apple has recanted the view that users shouldn’t need to dig through files and folders to find what they’re looking for. Spotlight already makes it easy for users to find files based on their attributes or content, and with Mavericks, Apple is encouraging users to categorize their files even further by using tags. Borrowed from the world of blogging and social networking, tags form a simple, arbitrary method of categorizing information. On a blog, you might add a bunch of tags to every post to indicate its subject matter. This has the benefit of letting users quickly find all the blog posts about a particular subject. With Mavericks, Apple wants you to consider tagging your files so that they’re easier to find later. In the sidebar of every Finder window (and some Open dialog boxes), there’s a new Tags list. Click on a tag, and you’ll immediately see all of the files on your Mac that have that tag. A small subset of your tags is listed by default, but if you click All Tags, a second column appears that lists every tag on your Mac. And if you start typing a tag in a Finder window’s search box, you’ll see an option to search for files containing that tag. Showing all files with a particular tag. In an evolution of the old concept of colored labels, there are also ways to identify tagged files visually in the Finder. In the new Tags tab of Finder’s Preferences window you can assign colors to tags (but there are only eight options to choose from), and also choose which tags show up in the sidebar. The Tags tab also offers a strip of circles that you can drag and drop tags on, which determines which tags show up in the File menu and in a contextual menu that appears when you control-click on an item in the Finder. The new Tags tab in Preferences gives you lots of power, but it can be a bit confusing. You can add a tag to a file when it’s born by adding them when you first save a document. In every standard Save dialog box in Mavericks, there’s a new Tags box immediately below the text-entry field where you name your file. To tag your file, just click in the window. First you’ll be presented with a drop-down featuring common tags, as well as a Show All link to display all the tags on your Mac. You can click on items from that list to pick them, or just start typing. Tag files right within the Save dialog box. If you’re typing a tag that already exists, a suggestion will appear below as you type. You can click on the suggestion (or just press Return) to accept the suggestion. If you’re typing a completely new tag, when you’re done just select Create New Tag or type a comma—the tags interface is essentially a list of items separated by commas. This means your tags can be more than one word long, if you like. 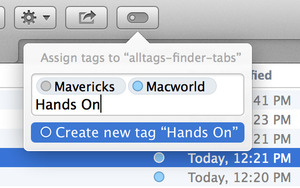 Once you start adding tags, Mavericks remembers the tags you’ve previously created and offers them as autocomplete suggestions, so you’re more likely to re-use existing tags rather than coin new ones. Once your file is all tagged up, click Save. That’s it. The tagging rides along with your file. You can also add tags to any file or folder via the Finder. There’s a new Tags icon on the toolbar of every Finder window, which will let you add tags to any items you’ve got selected. The process of adding tags there is identical to adding them via the Save box: click on the Tags icon and a text box will appear, in which you enter new tags. Adding tags from the Finder toolbar. You can also use the list of tags in the sidebar of every Finder window to tag items. Just drag items on top of one of the tags in the sidebar to add that tag to those files. There’s one other way to add tags to selected items, available via the File menu or from a contextual menu when you control-click. But this is the least appealing of all the methods, since it’s basically a renamed version of the old Labels command, and only allows you to apply tags that you’ve already created, and then only one at a time. Though adding tags in the Finder is a pretty easy process, it does require a lot of mousing around. I’m disappointed that there’s no keyboard shortcut to bring up the tagging interface, so more keyboard-oriented users could add tags without clicking on the toolbar. All of us have different ways of organizing our data. With tagging, Apple has provided Mac users with another organizational option. It won’t be for everyone, but I’m betting that some users will embrace it wholeheartedly. Apple may have shown the Finder some love in Mavericks, but the company still clearly believes that there are better ways of organizing your data than by just tossing files inside folders.